Lock in a great price for Zouk Hotel – rated 8.5 by recent guests! The private parking garage below my room and the layout and comfort of the room and bed. The bathroom was well equipped with toiletries and accessories and the walk in shower facility was very good. very good for business. just outside the motorway. easy to reach. not far from town center. malls in the neighbourhood. total privacy. Good bed, good bathroom, separate eating compartment, much privacy, dinner was very good, staff was friendly. Interesting concept for standalone rooms with in house parking lot. Excellent privacy protection. La discrección, la cama un poco pequeña pero muy cómoda. La comida estaba buenísima y que te lo entreguen dentro del armario sin tener que estar viendo al personal es un puntazo. El jacuzzi estaba muy bien, entrabamos tanto mi pareja como yo sin problemas. el desayuno es correcto aunque pocas opciones si no te gusta el café con leche (podrían sugerir infusion o chocolate o colacao). Por lo demás incluye zumo natural de naranja y tostada o croissant por lo que no está mal. La piscina, la carta en general; la cena fue espectacular, la habitación increíble, en recepción un chico muy amable. Todo muy bien, limpio, cuidado en detalles y para disfrutar !!!! 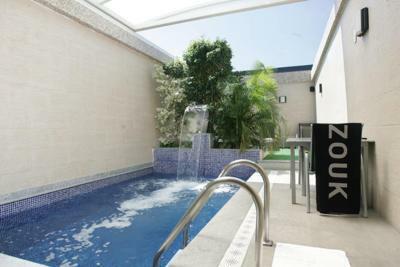 Zouk Hotel is located on the A-2 Motorway in Alcalá de Henares. 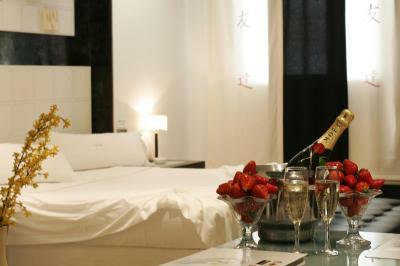 This stylish hotel offers discreet service and air-conditioned rooms with free Wi-Fi, flat-screen TV and an MP3 player. The elegant rooms at the Zouk feature a range of satellite channels and ceiling mirrors. 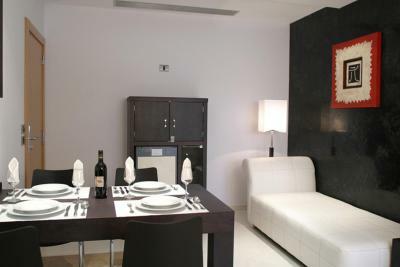 Each one has a dining area where all meals are served in the privacy of your room. There is 24-hour room service. Each room has a free private parking space, and you can check in and out without having to get out of your car. All rooms also have a private entrance. Hotel Zouk is 7 minutes’ drive from Alcalá de Henares’ beautiful old town, which is a UNESCO World Heritage Site. You can drive to central Madrid in just 25 minutes. This property is also rated for the best value in Alcalá de Henares! Guests are getting more for their money when compared to other properties in this city. 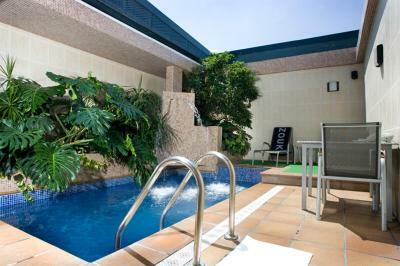 When would you like to stay at Zouk Hotel? This stylish, air-conditioned room features a private entrance, a range of satellite channels and ceiling mirrors. There is a flat-screen TV and MP3 player, and 24-hour room service is available in the privacy of your room. Each room has a private parking space. This stylish, air-conditioned room features a private entrance, a range of satellite channels and ceiling mirrors. The private bathroom has a spa bath. There is a flat-screen TV and MP3 player, and 24-hour room service is available in the privacy of your room. Each room has a private parking space. 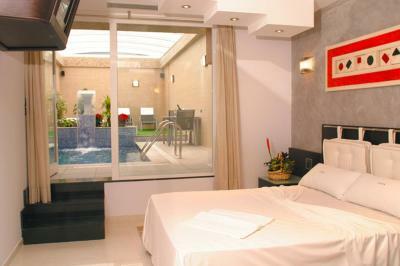 This stylish, air-conditioned room features a private garden-terrace with a pool and retractable roof. There is also a sauna, a private entrance, a range of satellite channels and ceiling mirrors. There is a flat-screen TV and MP3 player, and 24-hour room service is available in the privacy of your room. Each room has a private parking space. This 80 m2 Superior Suite has a private pool and a waterbed. It also features a sauna, a hot tub, a sun terrace and a garden. This Executive Suite features a private pool. House Rules Zouk Hotel takes special requests – add in the next step! One older child or adult is charged EUR 54 per person per night in an extra bed. Zouk Hotel accepts these cards and reserves the right to temporarily hold an amount prior to arrival. Should have done more research - this hotel is primarily for discreet intimate nights. Never been to anything like it. Appeals only to certain types of couples. The hotel was unsuitable for family use. It is an "adult liaison" location for secretive couples wishing to remain totally anonymous. surroundings and view from window not exciting: industrial area. ok for business. Cigarette smell in the room, breakfast not very good, bad location with industry and supermarkets, malfunctioning airco, Wi-Fi unreliable, obviously more a motel for couples and not for business travellers like me. The Breakfast was very disappointing. The breakfast was included in the room price. When it was served all we got was one croissant each, a pat of butter, and a individual conserve pot. To accompany this a pot which just held two cups of coffee and some warm milk. The Jacuzzi there weren't any instructions how to use it. Not ideal to have the shower installed over the Jacuzzi as for shorter people it would be hard to climb into the Jacuzzi to have a shower. No instructions in the menu package who to contact to order meals. Bed comfy. Warm big room. Quiet room. Very poor breakfast, noisy room..too many mirrors in the room. This hotel (or should I say MOTEL) is classified as a Hotel here at Booking.com. This is NOT a Hotel, it is a Motel with the usual clients... The sheets were completely impregnated with cigar smell, they use some kind of active agent to try and clean the air at each room but the truth is that it is something my lungs didnt like and I ended up sick on the day after.